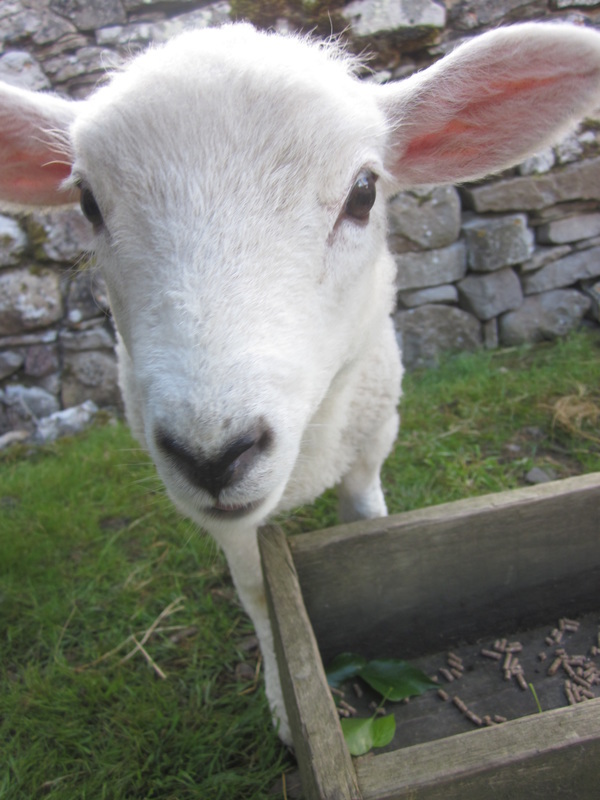 Last September/October we had a particularly good set of lambs including a small rather inquisitive lad called Walley (he has a wall eye). He was our second born and wanted to know what was going on from day one! 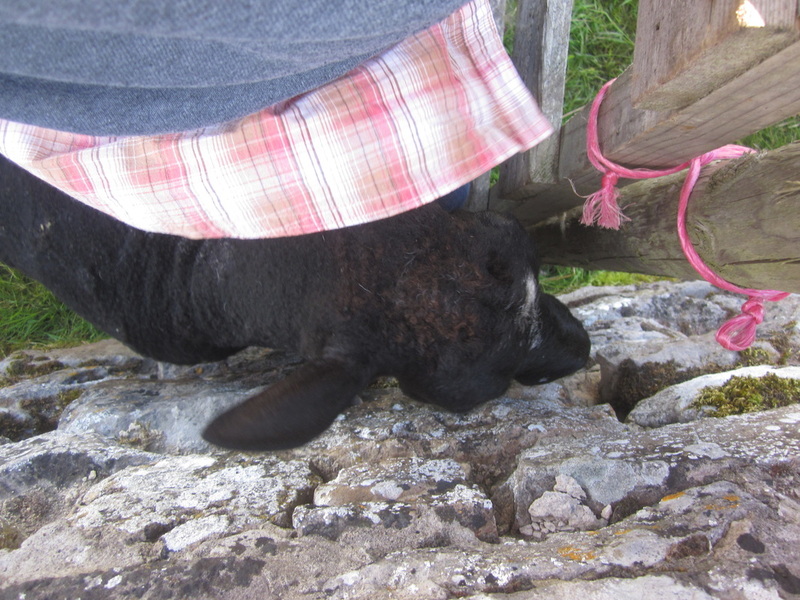 We were also a little late in separating the lambs from their mothers, so with one thing and another diverting our attention elsewhere, a certain little dad took rather too many liberties with ladies who should have known better. We thought nothing of it at the time, putting it down to boys games. Then in February we lost both our beautiful tups, Norman had suffered a throat infection, which reoccurred and unfortunately we had to do the decent thing, then a fortnight later, my beautiful Dylan got kidney stones, with the same awful result, so we were tupless!! I decided to go down to the Exeter Sales with my very good friend Sheila, where to cut a very long story short we returned home with a Poorton tup each, we have called ours Bentley, and he's a wonderfully kind and sensitive lad. He was promptly put to work, but we were very surprised when some of the ewes refused to come into season..... We were even more surprised when a lamb appeared with Dora on 24th June, followed by another 2 days later with Noodle! We then noticed that Louisa's udder was becoming enlarged, in fact it ended up looking more like a cow that a sheep, however on the evening of my birthday she became very licky so we new something was afoot! By 6.30 she had a son and by 7.00 she had 2 daughters, both born backwards, but fine. We came home to get some colostrum as she had settled down and we made sure that they were all suckling. 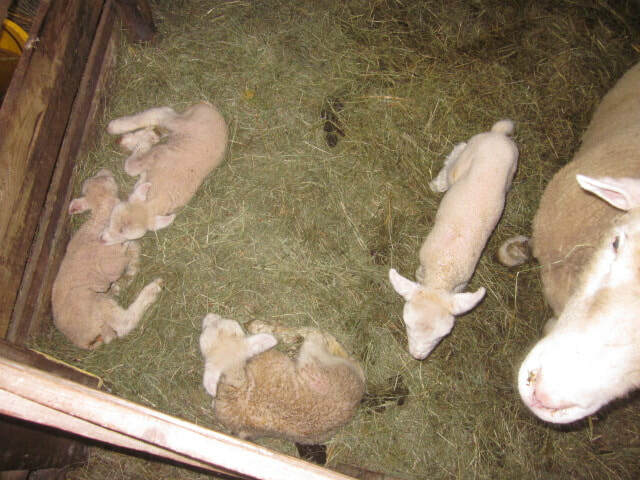 I returned a couple of hours later to check on the family and to my amazement there was a 4th lamb. All are doing really well and I have started training them to the bottle today, which they are doing without any problems at all, so once they are coming to me we can assist and let them out into the field!!! Situation normal here in the Yorkshire Dales!!!!! p.s. it's so nice to be writing again! I've missed you! After the unsettling circumstances of Tuesday I needed to check the hillside field yesterday, knowing that Lilly would no longer be at the gate to meet me. Having read all the lovely comments on social media in the morning, (thank you all so much) I'd put it off until the afternoon. I took a bucket of nuts for anyone who wanted them and then climbed the hillside to see those who were still grazing beyond the treeline and the brook which runs down from the moor. Mitsie is the matriarch of the field these days, with Pixie and Archie not too far from her side....... Teddy is with the male lambs who have been separated off, but Archie has been castrated so he'll come away when all the May born lambs are spained tomorrow, this will leave Mitsie on her own with the female lambs until we return Willow from intensive care! Insistently she's doing really well with the new worm doze working well, we just need to put some flesh on her bones before putting her back into the field..
We are bringing the rest of the sheerling gimmers back from North Walden tomorrow so that all the sheep that are to be tupped in October are together, and hopefully the newly spained ewes, including Peewee will catch up and come into season at the same time as the rest. 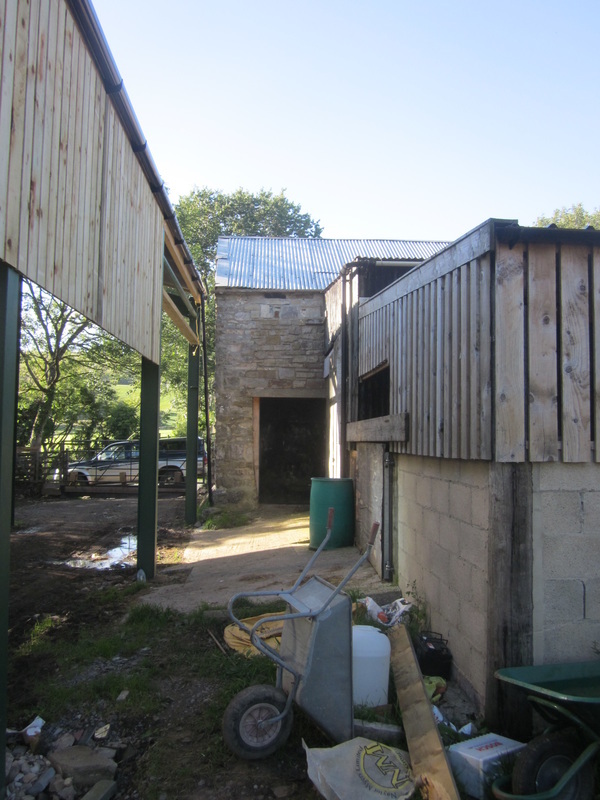 We are trying to get ourselves organised into two lots, lambing 6 months apart, with the Dorsets in September/October and the Mules in March/April. It is also why we are putting up a new building so that we are organised. It'll take a year or so but it will be worth it. More about and our fight to get power to the buildings later! We're having a horrible evening. Sometimes things sneak up on us, and there is simply nothing we can do about it.. and tonight is one of those evenings. I took some lovely new pictures of Lilly at the weekend, she's been doing so well. 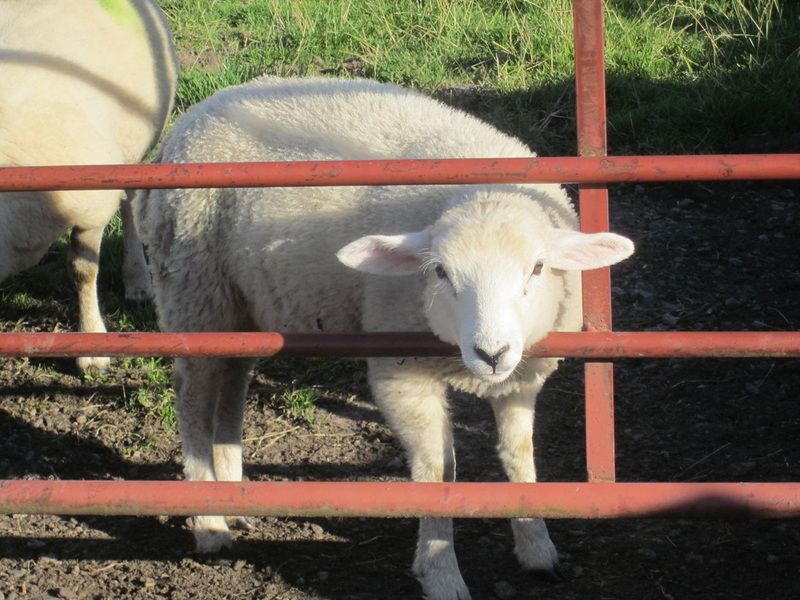 She has merged with the flock in the hillside field, but still waits for me at the gate every morning and every evening, without fail, its my morning tonic.... she is so full of joy and there isn't a bad bone in her. This morning was no different.... she had one of her last bottles today as she was 3 months old yesterday and we are spaining all her compatriots this week, and as they will no longer be on their mother's milk, nor will she. We both walked round the 10 acre field checking that all was well and giving those needing a cuddle their morning attention, although Lilly gets a cuddle every time so her sense of being very special isn't diminished!! We concluded with Willow, who has been getting special attention for the last month as her weight has been causing concern... she has been getting steadily skinnier. 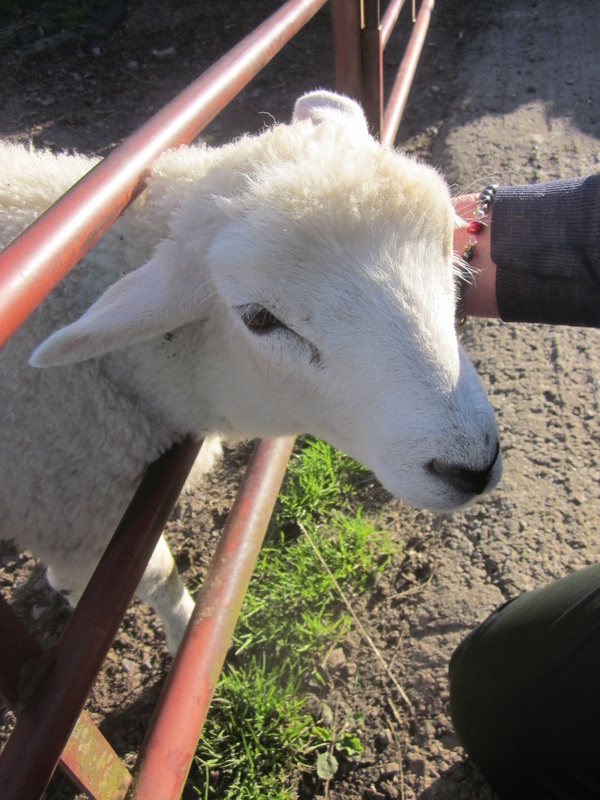 We dozed her for worms twice, and this morning I decided to walk her down the field, out across the lane and down into home field and on to the barn... for a short stay in intensive care! I took a poo sample for the vet and dropped it off this afternoon..... it seems that our local worms may be resistant to "white" doze so now we've got some yellow. We have given her some, together with some "gel-lite" that will help get her electrolytes back in line! ... and will monitor her, with another poo sample due at the vets in 7 days time. She was a few yards away, tucked under a wall, I called to her, but she didn't stand up she just called back...... I went up to her and stroked her ears, there was something terribly wrong...... we picked her up, put her straight in the trailer...... While Nigel turned round I called in at Nanny McHawkins, across the lane, and asked her to ring the vet and to let them know we were on the way so they didn't close up and leave the surgery and we drove straight there.... Amy was waiting, I think she was expecting to see Willow not Lilly... we took her in and she was put on the table.... laying on her side with her little head in my hand........ I quietly talked to her... She was getting weaker..
We all decided that there was nothing to be done and the best and only thing to do was to assist her to painlessly leave this world without delay........... I held her until she took her last breath so she wasn't scared.... I couldn't believe it. The thing was.... what on earth had happened in such a short time to cause such a dramatic end?....... so it was agreed that we should do a postmortem there and then.... Amy very kindly asked if we would like a cup of tea and if we would like to sit in the waiting room... "No" was the answer, I had helped Curley hamster give birth to Lilly at the end of May and I wasn't going to sit anywhere other than by her side during this last investigation into her little life. Two years ago we had had a lamb die unexpectedly and I had attended her postmortem... she had suffered a twisted bowel... one of two that happen on average in the whole of the Yorkshire Dales each year... it's very rare... so we were all dumbfounded to find out that poor Little Lilly had suffered the same fate........ There is nothing that can be done... there is no fault to be placed... its just one of those awful things. She never ceases to amaze me! 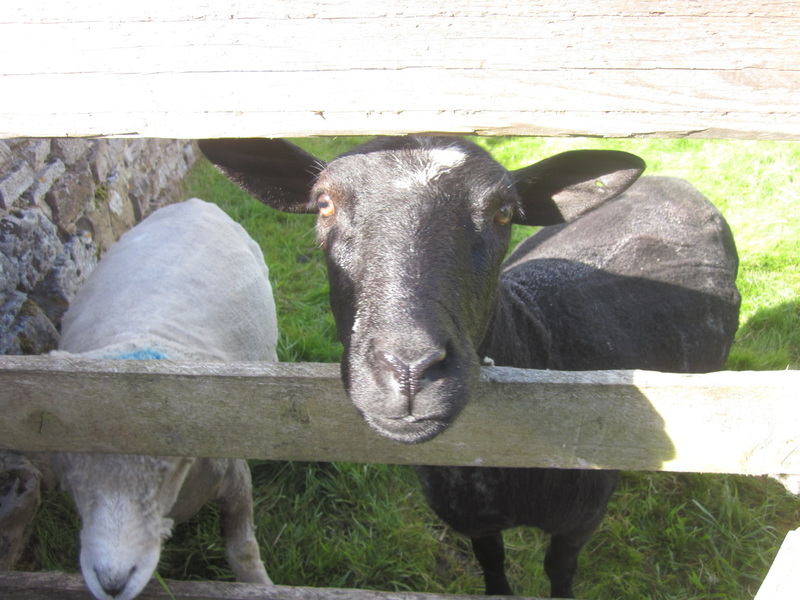 Today we decided to move Lilly and her babysitters from the garth behind the Reading Rooms to new pastures. They had been there for a few weeks, and the supply of grass was getting low, and Lilly's first foray into life had been a success. 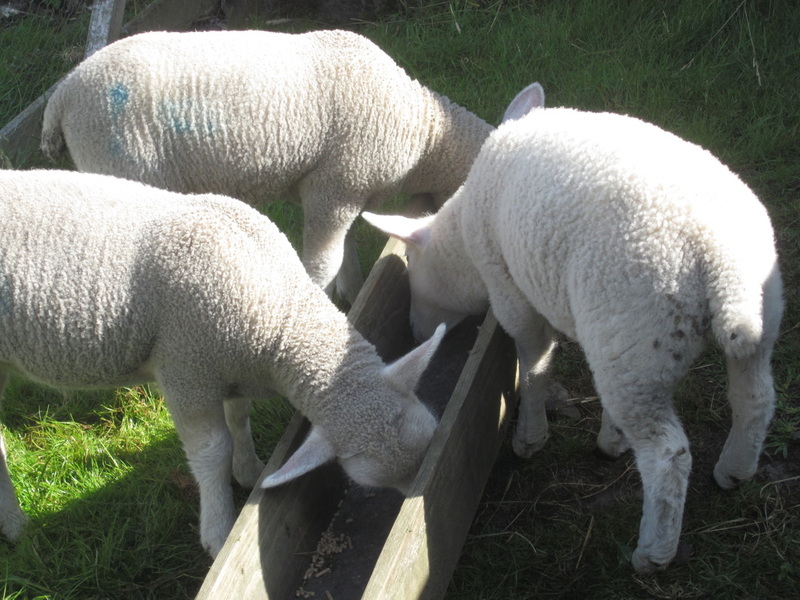 They are very easy to round up as the five lambs are now used to eating from the trough in the pen, and the mums are always excluded, much to their constant annoyance, so when we want to catch them all we just let the mums in...... simple! I know Lilly is in good hands...... but perhaps she still needs this late feed until she has settled down again..... Its a big world for someone so little, even with the help of a superstar! ..... and we're all quite tired after a long day! There are still lots of jobs to do before we can settle down for the evening, as all the stock need checking and feeding before we can stop....... think these two have about had it! Honestly! 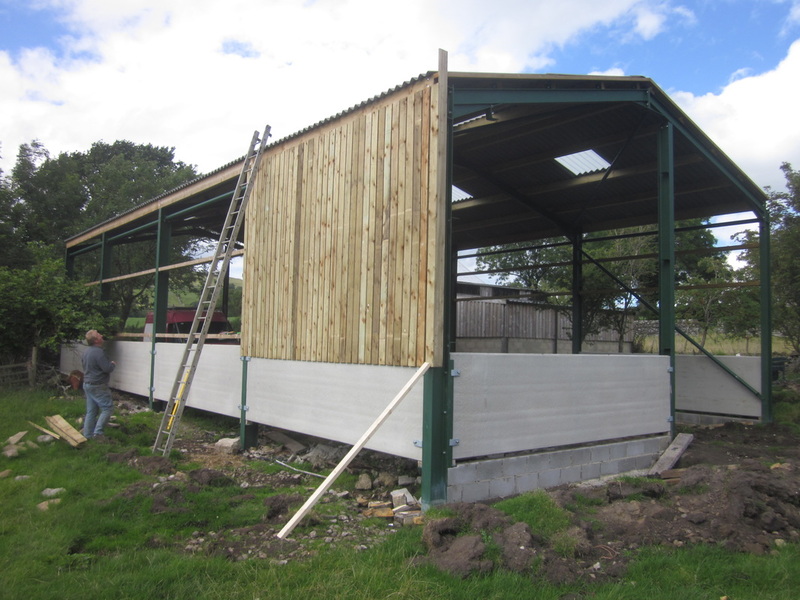 We had planned to put up a new building at the side f the old barn while Nigel's father, James, was still with us, but after we lost him a year ago, we decided to complete the plans anyway. The metal frame of it was put up weeks ago, and we had a long wait for the concrete sides to come... they arrived last week, and were duly slotted in, with the help of friend Richard and his son Will, with their Manitou, while I had the job of bolting the brackets into place while the gents did the heavy work... I did enjoy getting stuck in with some proper help instead of standing on the sidelines like a big girl! Today Nigel and I have spent this afternoon putting up some the Yorkshire Boarding, a long job to nail them into place.... each has to be upright and spaced exactly, they all cut to the same length but have to be positioned to run perfectly along the same line, top and bottom,,,, we almost managed a whole side before running out of energy and nails! 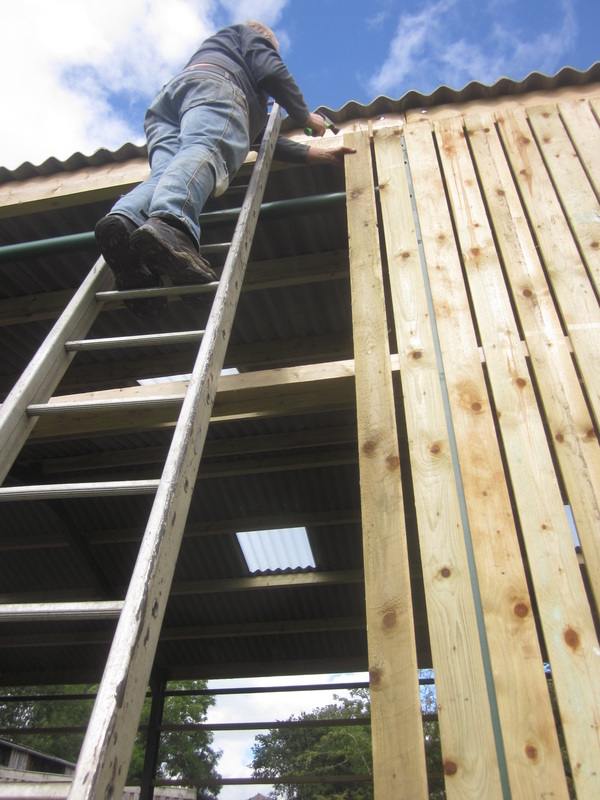 Nigel did the top and middle, as I'm not fussed about heights or ladders, and I was put to work on the bottom, making sire that it lined up perfectly and then duly nailed into position..... 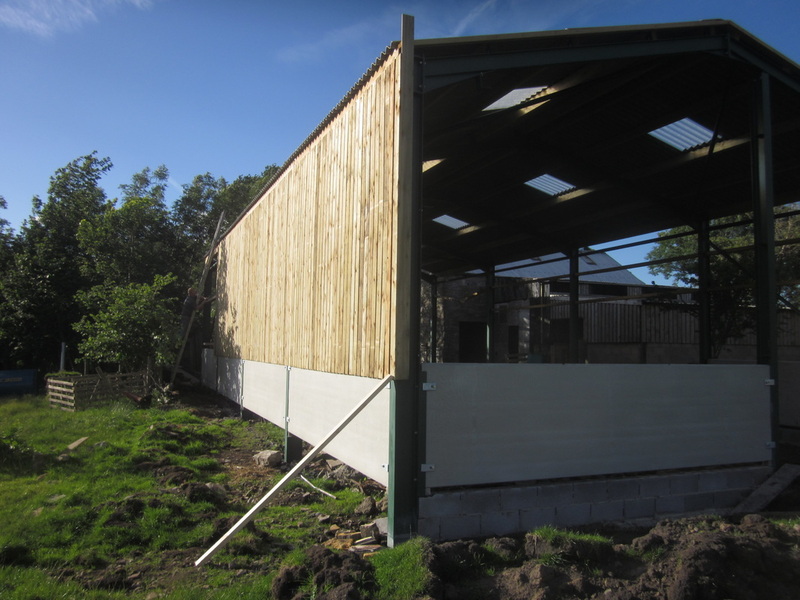 I'm really proud of what we achieved, and the barn is starting to take shape.... it has to be ready for when the Dorset ewes start lambing again in November and December! We'll have lots more space and can be much more organised about it......... Luxury girls!! A new member of the family- Richill No Limits! Last September at the Masham sheep, we were lucky enough to meet two breeders, both passionate about their Poll Dorsets and who introduced us to the Dorset Breeders Association, one was Sheila, and the other was David, who was talking to Sheila at the time while I hovered about wanting to discuss tups, both were keen to let us know that there was a "Northern" branch of the Society and that we might like to consider joining..... We didn't take them up at the time as we has so much going on, but when Alec and Ann came to visit they also had some very sad new... 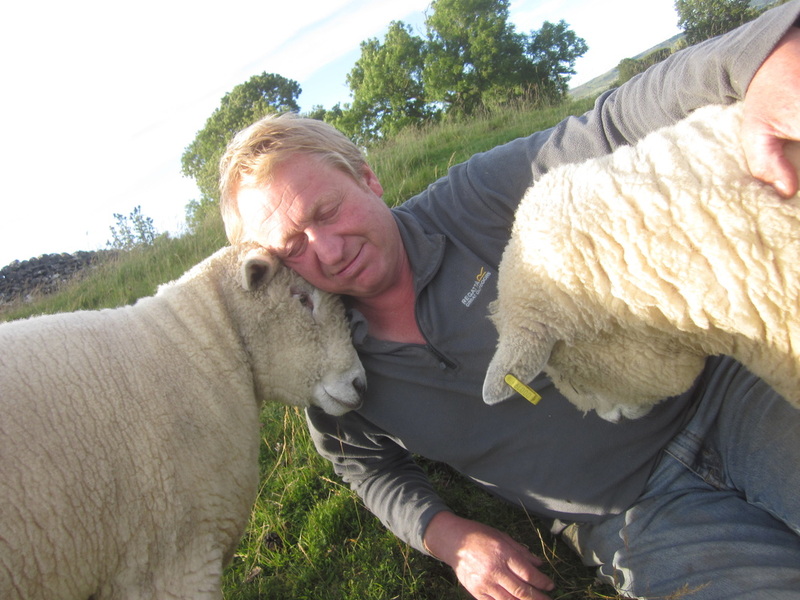 Unfortunately David had recently passed away, but his daughter Claire was taking over his flock. Now when a tup has been in the flock for some time, they start to be related to most the females and periodically need to be changed, this was the case for Clare's tup, a slightly older boy, but who in his day had won prizes and had also sired some extremely good offspring..... he needed a new home... Nigel and I discussed his circumstances, and decided that we could probably do with a back up tup, and so called to see if this would be acceptable......... the answer was yes... so we hitched up the little trailer and went to meet Claire and her family and to collect "Richill, No Limits"....... who is now known (with Claire's approval) as "Norman"
We brought him home and called in at Brian's field, as he was clipping.. Norman was still fully clothed and was rather warm so he was soon relieved off his fleece..... had a quick solution of fly strike to make him safe, and then was unleashed on our already tupped Dorset girls, just in case any one had gone over... He has settled in with us really well, and is happy to eat nuts by hand every day and is clearly a very laid back gent....... We love him and hope he will be with us for many years come! Thanks very much Claire, he'll be treated like the v.i.p he is! 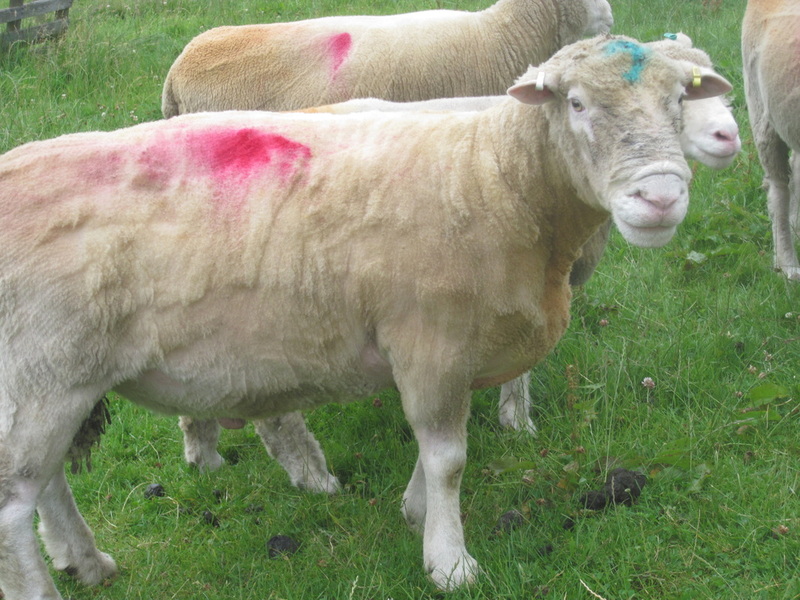 ............ oh the blue mark on his head is just foot rot spray..... as he decided to squeeze past a gate and over a wall to meet Dudley and Vincent.... by the time we got there, he clearly had them bossed! It's almost a year ago that we acquired our first 6 Poll Dorset ewes, and my love and enthusiasm for them only grows with time.... now that we have had the flock registered for pedigree status, there is another direction in which we could go, and that is in showing them at some of the local agricultural shows during the summer season..... I just have no idea how this is done. 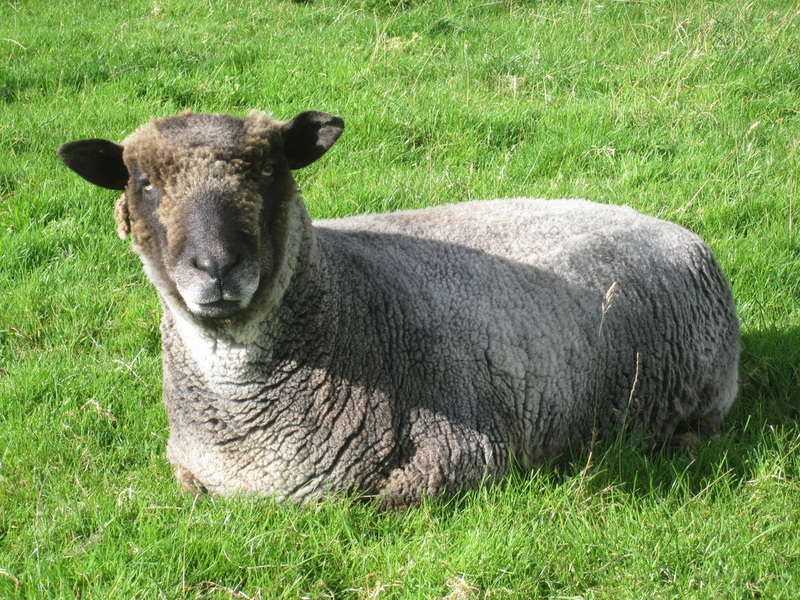 It was also last year that we attended the Nidderdale show at Pateley Bridge and later the Masham sheep fair, where we met some more breeders, especially Sheila, who is fast becoming more than an acquaintance and I hope she won't mind me referring to her as a friend!... Sheila has been showing Dorset sheep for many years and has a fine collection of rosettes and cups.... and when we met earlier in the year, kindly agreed to allow me into her sheep shed when preparing her sheep for showing, and as she is attending one of her first shows of the season at the weekend, this was the week! So yesterday I had an early start as all my usual jobs needed doing, including Lilly's breakfast.. and I was ready for the "off" by 8.30.... it takes about an hour and a half to drive down, through breathtaking countryside to Sheila's farm, and arrived in good time to have a cuppa and a catch up before getting down to the job in hand! The first thing to do was some halter training, as one lamb is a complete novice and has never worn a halter before, so we bridled them up and started walking them round..... trouble was, I was a complete stranger, and "surprise surprise"... sheep do love their owners..... so the young lady who I was leading reared up like a little horse and wouldn't walk anywhere unless she could see her "mum"! ... eventually they settled down and we strolled round with a little pushing and shoving from behind for the trainee... she did exceptionally well actually, and soon got the hang of it! Thank you so much for your time and your help Sheila, and for a delicious lunch too!! I'm so grateful.. and good luck with this year's shows, I'm no judge but I bet you'll be adding to your prize collection!!! ....And for my first attempt...... watch out Ellie-Mae!!! 2 years on and She's still my girl! I've just been round to the reading room field to give Lilly her lunch, half a bottle of milk which is now one third of her daily intake. I've reduced her meals down to 3 milk with the addition of 2 creep feeds to get her growing at the same rate as the other lambs. This meal was delivered with a side order of ivy leaves while sitting on the side of the water trough, it has a cover on the water intake which makes a convenient seat when it hasn't been raining and Lilly knows the routine very well....... only today Peewee had other ideas! We have put Lilly into the little garth in West Burton, with Peewee, Lupin and their lambs with the addition of Dixie and Tottie... all of whom were raised in this field as lambs and know how the gate on the pen works... it has a gap in it so that lambs can pass through to eat creep feed from the trough but mums can't get in..... except for this year.... when a modification has had to be made as Peewee and Tottie have made it very clear that they can still push through with a bit of effort! I love this picture....... I do believe that one of Peewee's lambs is actually laughing at her!! ...... and these two will soon find out how to get through the gap and join the other 3..... if she lets them! !